There are evening escapes that require a pinch to fully appreciate you are not dreaming. Not that many years ago, I sat terrified/huddled in my motel room fully dressed at 4 pm and not until 10 pm did I muster the courage for a quick drive around the block. Wasted hours, days, years. Caitlin's and my evening escape is chronicled above in photos. We started our evening at the world famous Colony Hotel with drinks surrounded by friends that know us both. After we walked about a block past elegant shops to Cafe Flora in Via Amour, midway down Worth Avenue. There are just a few indoor tables with the beauty of this dining experience being outside in the courtyard of the Via. This was February 1 with no coats or heaters required; starlight and the moon above. Dinner was wonderful and we did not rush. 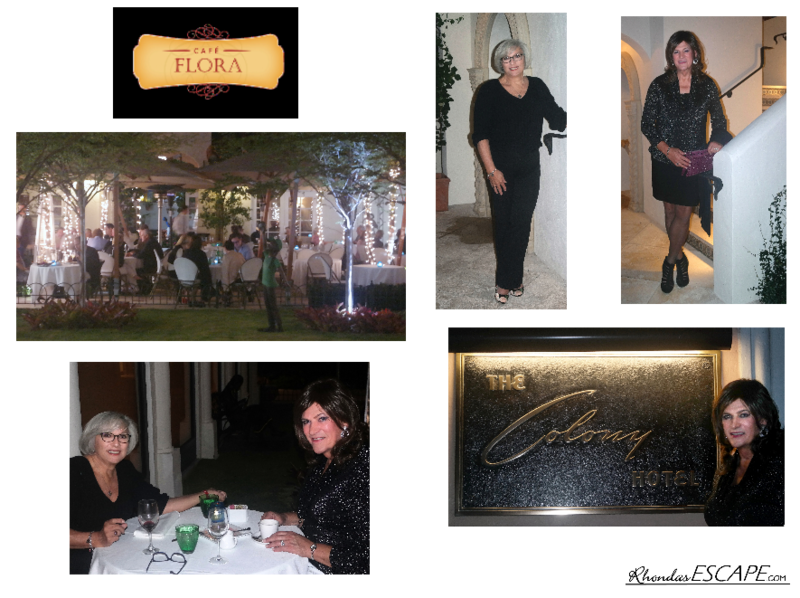 Surrounded with colorful bougainvillea, fountains and manicured gardens, Cafe Flora is enriched with gracious hospitality in a polished "secret garden" atmosphere. Owners Heinrich and Pamela seek to inspire and transport guests, providing a rare combination of sophisticated cuisine appropriate for Palm Beach's formal, white-linen dining destinations with the warmth and hospitality of a neighborhood favorite. Tucked away from the bustle of Worth Avenue in a picturesque courtyard behind Hermes and Jimmy Choo, camera-shy celebrities and other local notables often seek refuge in dining at this "hidden gem". Yes, we did feel like celebrities; treated as such and enjoyed our elegant evening on Worth Avenue. Thank you Caitlin for a wonderful evening. Are you still huddled in fear? Don't be - ESCAPE and live your life to the full. That sounds like a great place to eat. Too bad I could not join you. we were actually down in Florida last week staying on Hutchinson Island. That day we had gone up to Sebastian to have a long lunch with some friends who live in Merritt island. Perhaps next year when we are in Florida again we can arrange to get together.